Download "B. Intended Audience: Freshman level course." 3 times. All criminal justice courses whether online or in-person will have an online Blackboard feature that allows students to access power-point presentations, assignments, the course syllabi and other relevant information. 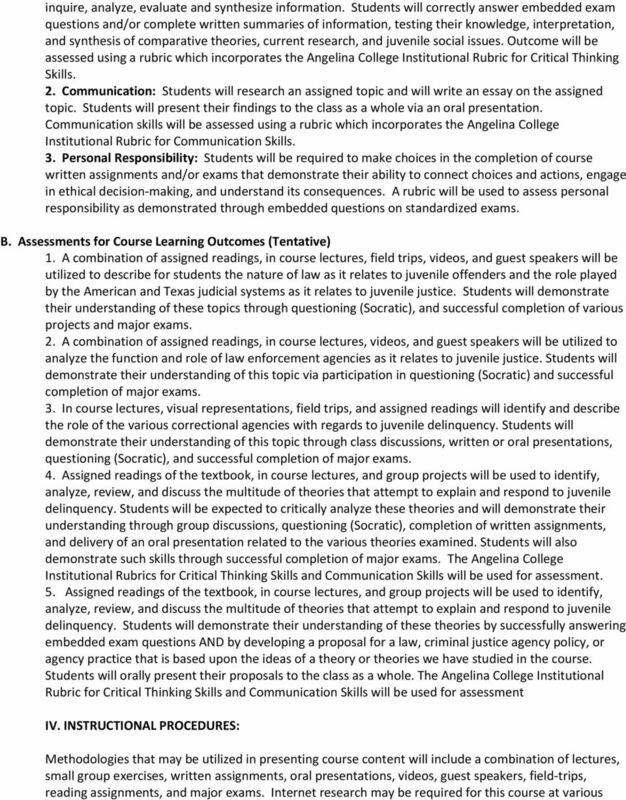 V. COURSE REQUIREMENTS AND POLICIES: A. Required Textbook(s) and Recommended Readings, Materials and Equipment: Required Textbook: 1. 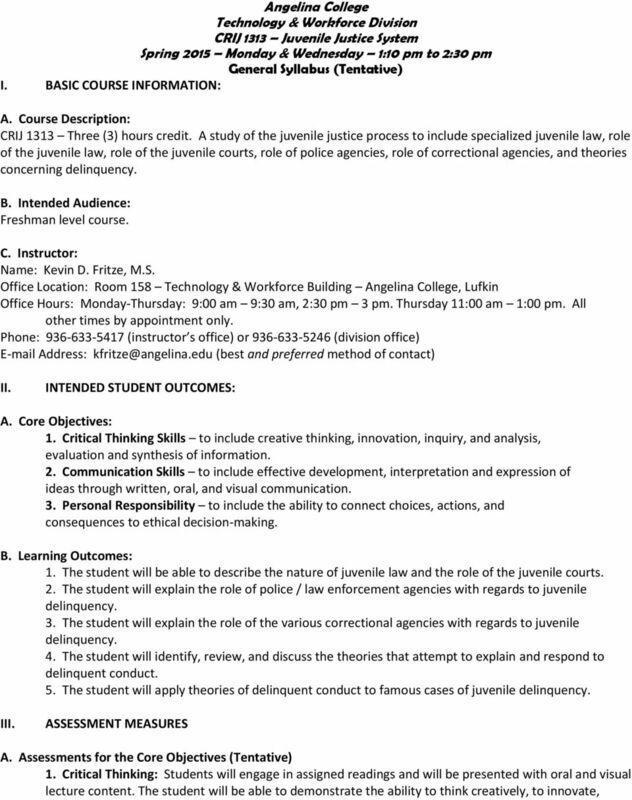 Juvenile Justice: Policies, Programs, and Practices. Taylor, Robert W. and Fritsch, Eric J. 4th edition. McGraw-Hill, Recommended Books: 1. Publication Manual of the American Psychological Association, 6 th edition. 2. Current edition of either Blacks Law Dictionary or Oran s Dictionary of the Law Other Materials: 1. Each student must have a Scantron Form 882-E and number 2 pencil for use on each exam. 2. Spiral notebook or binder for note taking 3. Highlighter for textbook review, etc. 4. Computer with internet access. Familiarity with Microsoft Word and Microsoft Power-Point B. 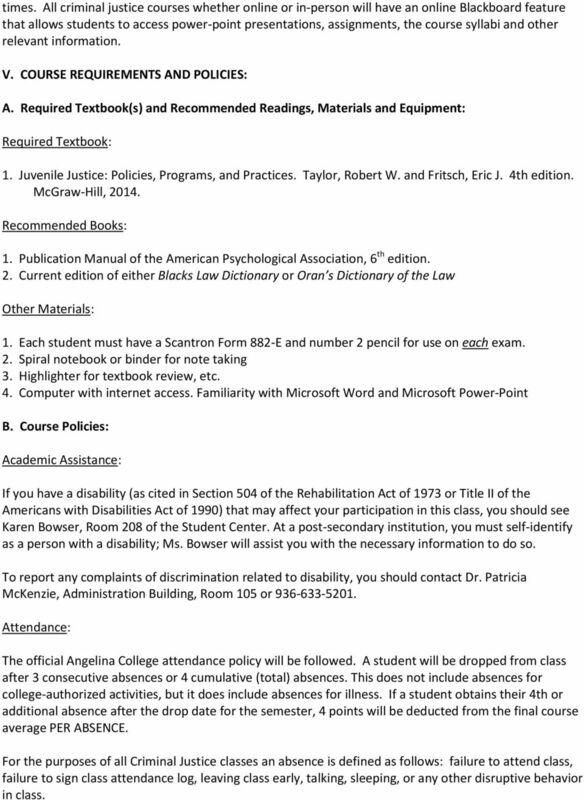 Course Policies: Academic Assistance: If you have a disability (as cited in Section 504 of the Rehabilitation Act of 1973 or Title II of the Americans with Disabilities Act of 1990) that may affect your participation in this class, you should see Karen Bowser, Room 208 of the Student Center. At a post-secondary institution, you must self-identify as a person with a disability; Ms. Bowser will assist you with the necessary information to do so. 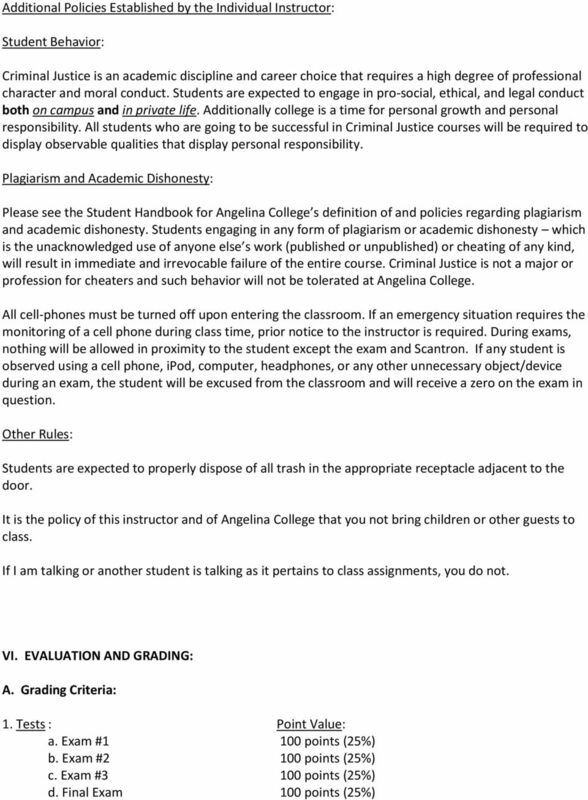 To report any complaints of discrimination related to disability, you should contact Dr. Patricia McKenzie, Administration Building, Room 105 or Attendance: The official Angelina College attendance policy will be followed. A student will be dropped from class after 3 consecutive absences or 4 cumulative (total) absences. This does not include absences for college-authorized activities, but it does include absences for illness. If a student obtains their 4th or additional absence after the drop date for the semester, 4 points will be deducted from the final course average PER ABSENCE. For the purposes of all Criminal Justice classes an absence is defined as follows: failure to attend class, failure to sign class attendance log, leaving class early, talking, sleeping, or any other disruptive behavior in class. 5 2. Late Assignments or Missed Exams: No late assignments will be accepted. No questions, no exceptions. Missed exams may be approved for make-up on a case by case basis only if satisfactory documentation is provided. Any approved make-up exam will be administered at the end of the semester on a day set aside for make-up exams. 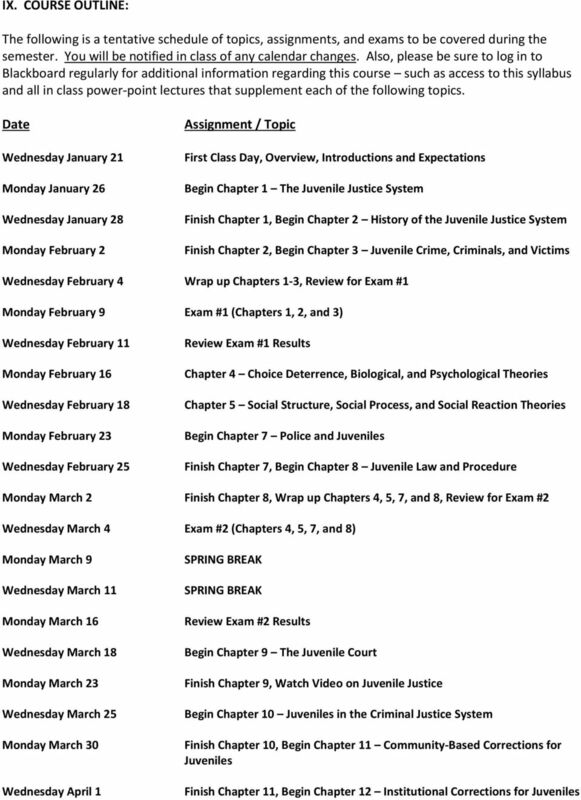 The makeup exam will be different than the original exam (see attached course schedule for make-up date and time). If you do not take a missed exam on the exam make-up day you will receive a zero on the exam in question. There will be NO MAKE UP for the final exam due to end of semester deadlines. 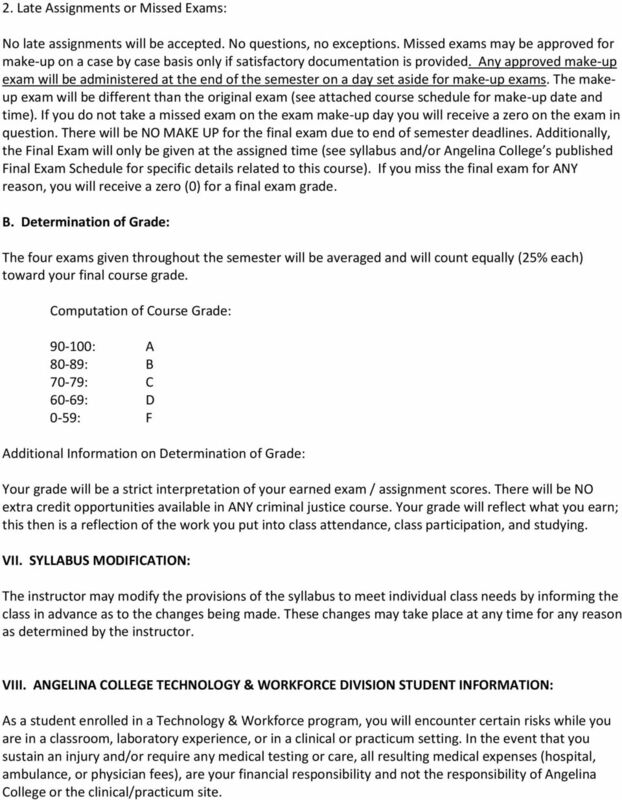 Additionally, the Final Exam will only be given at the assigned time (see syllabus and/or Angelina College s published Final Exam Schedule for specific details related to this course). If you miss the final exam for ANY reason, you will receive a zero (0) for a final exam grade. B. Determination of Grade: The four exams given throughout the semester will be averaged and will count equally (25% each) toward your final course grade. Computation of Course Grade: : A 80-89: B 70-79: C 60-69: D 0-59: F Additional Information on Determination of Grade: Your grade will be a strict interpretation of your earned exam / assignment scores. 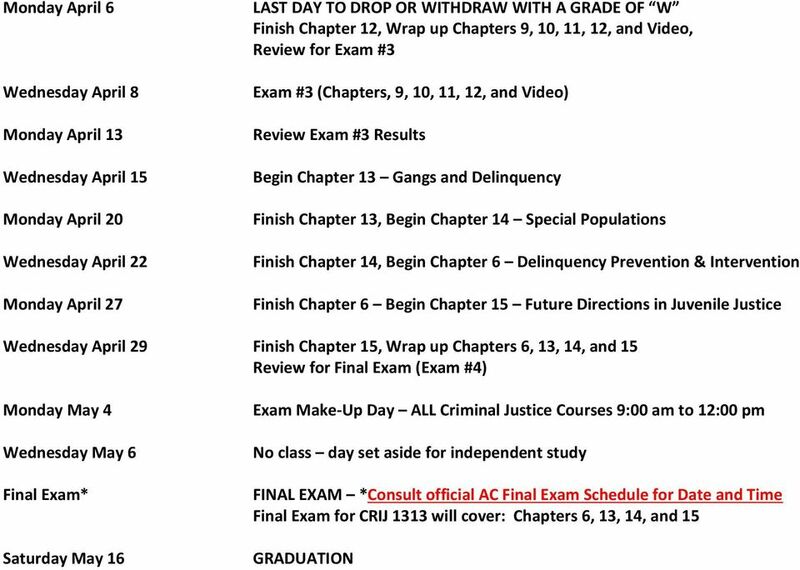 There will be NO extra credit opportunities available in ANY criminal justice course. Your grade will reflect what you earn; this then is a reflection of the work you put into class attendance, class participation, and studying. VII. SYLLABUS MODIFICATION: The instructor may modify the provisions of the syllabus to meet individual class needs by informing the class in advance as to the changes being made. These changes may take place at any time for any reason as determined by the instructor. VIII. ANGELINA COLLEGE TECHNOLOGY & WORKFORCE DIVISION STUDENT INFORMATION: As a student enrolled in a Technology & Workforce program, you will encounter certain risks while you are in a classroom, laboratory experience, or in a clinical or practicum setting. In the event that you sustain an injury and/or require any medical testing or care, all resulting medical expenses (hospital, ambulance, or physician fees), are your financial responsibility and not the responsibility of Angelina College or the clinical/practicum site. * Please use this email. I post grades in Blackboard, but I don t regularly monitor the mail feature in Blackboard.